Martinique du Preez (19), a transplant athlete from the Haarlem Community in the Southern Cape, received assistance from the Haarlem Transformation Committee (HTC) and Casidra towards his sports gear. 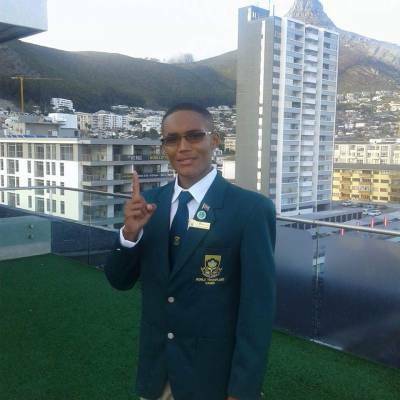 This young man was one of 65 transplant athletes chosen to represent the South African Team at the Official World Transplant Games held in Mar del Plata, Argentina from 23-30 August 2015. Casidra manages the apple farm Anhalt and some years ago Casidra’s Management approved the HTC’s request to reserve funds on the Anhalt budget for potential community projects in Haarlem. This is aimed at ploughing back into the Haarlem community in the form of a Social Responsibility Programme. A very humble Du Preez is grateful for everything he received and thanked the HTC and Casidra for their contribution towards his trip to Argentina. During a farewell ceremony held at Newlands before their departure, the South African Transplant Sports Association (SATSA), which Du Preez is affiliated to, expressed their gratitude for all the sponsorships made. During the ceremony, Du Preez was awarded his Senior Protea Colours. The CEO of Casidra, Michael Brinkhuis, was invited to the ceremony and said, “I felt so privileged to be amongst those who bid farewell to the SA Team. It is very overwhelming to witness the joy of these young athletes who were acknowledged while preparing to represent the country abroad”. Brinkhuis said that what stood out the most for him was their positive spirit, enthusiasm, an attitude of readiness and looking forward to represent South Africa. SATSA was established in 1994 as the Transplant Games Association of SA by a small group of organ-transplantees who felt the need for such an organisation. It is recognised by the International Olympic Committee and Department of Sports and Recreation of SA. Their vision is to be a leader in optimising the quality of life of organ transplant recipients, and through sports and other physical activities, promote organ donation and transplantation. This association has attracted a large number of athletes from previously disadvantaged communities such as Du Preez and due to their financial circumstances, support in the form of donations is of more importance to assist them in reaching their dreams and goals. Brinkhuis concluded by saying, “We are proud of Du Preez as a kidney transplant athlete who stood up, followed his dream and is now representing our country in Argentina. We wish him well. He has become a great example amongst the youth of SA, particularly youth from the previously disadvantaged communities”. Du Preez wrote on his social media page, “God is taking me to another level. Being a brand ambassador for South Africa is awesome and best of all being God’s miracle child in Argentina is favour, grace and His perfect plan. I was fortunate to be part of an amazing team representing our country and it was by far the greatest experience in my life. We made the best of every second and no moment passed without a smile”. We thank you for flying our country’s flag high!